And I was playing with Android Studio, which i recently downloaded. The coding environment is familiar as I am used to code with IntelliJ Idea, the gear behind Android Studio. My last post, about External Process Execution in Java, put some curiosity on my mind, Android is basically Linux OS, does it has the tools/commands as those on My Ubuntu machine? Grab my Note with KitKat, open up ConnectBot and launch local shell. Well yes, ping is there. 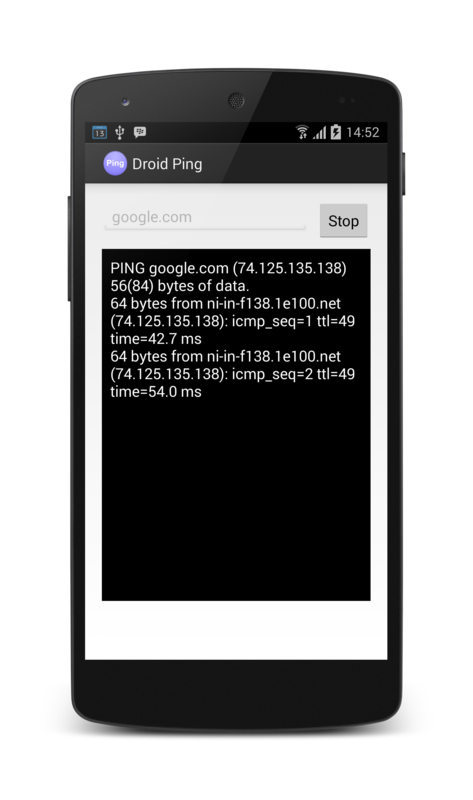 I started to craft an Android Studio project to create this ping application. The concept is similar, though i need to make some optimization on the JPinger class, for instance, decreasing the number of thread needed to handle the java Process (the ping itself). And here it is, DroidPing. Feel free to download and use. If you want to support or help, please contact me.